Salty, savory bites are my favorites, no question about that, so those flavors were the drivers in my search for this month's Secret Recipe Club choice. I enjoyed browsing through nearly 4 years worth of Corina's posts at my assigned site, Searching for Spice, a UK blog packed chock full of sweet and savory items. Some sweets, like Rocky Road Squares, did tempt me, and I'll revisit them for the holidays. Corina's Cardamom and Pistachio Ice Cream sounded divine too, but this month I focused on her many savory recipes. Two fish preparations were strong contenders, one a Jamie Oliver recipe for white fish cooked with spinach, olives and tomatoes, and another for fish baked en papillote with olives and lemon. Olives drew my attention again in a tapenade. I sense a pattern there. 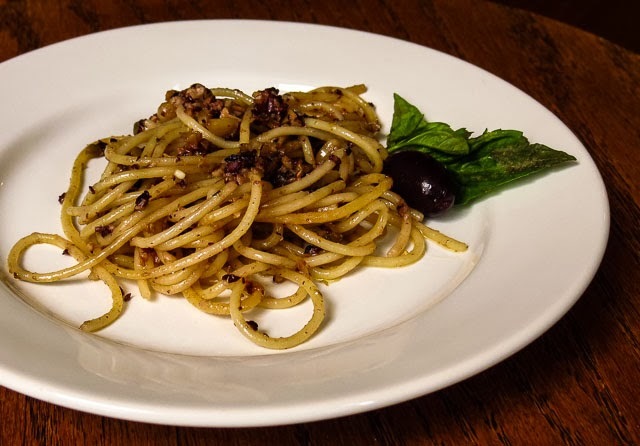 Unable to decide between recipes for pesto and tapenade, I took the easy route and combined elements of both, adding a few extras along the way. It sounds a bit random, but it worked. Pesto [PEH-stoh] — This uncooked, herbal sauce comes from Genoa. Classic method is to combine crushed or chopped fresh basil, pine nuts, parmesan cheese and olive oil. 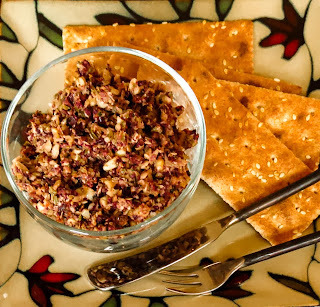 Tapenade [TA-puh-nahd; ta-pe-AHD] — This tasty thick paste comes from Provence. The ‘classic’ ingredients are capers, anchovies, ripe olives, olive oil, lemon juice, and seasonings. It is classified as a condiment. 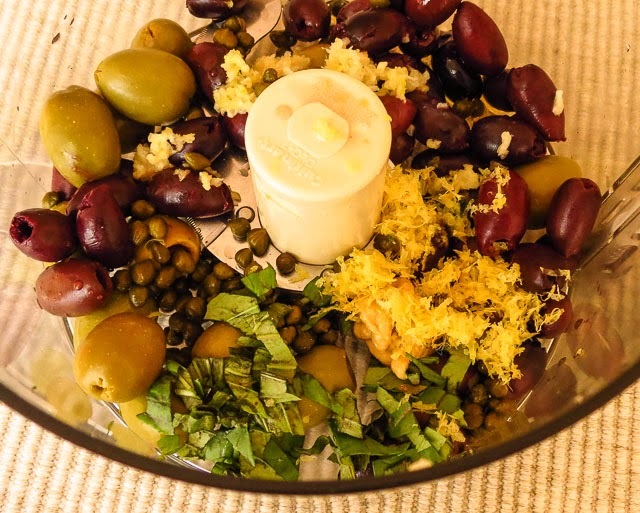 First up was the tapenade, a chunky mix of green and black olives, capers, fresh basil, lemon zest and juice plus a lot of garlic. Anchovies are traditional, and I do love them in dressings and on pizza, but the saltiness of this mix was already over the top. So I skipped the anchovies and added a dollop of Dijon mustard and a sprinkling of dried Italian herbs instead. After a few quick pulses in a food processor the tapenade was almost what I was looking for - tangy with a bit of a bite. More fresh basil, some toasted pine nuts, a jar of marinated artichoke hearts and a cloud of grated Parmesan cheese joined the party, followed by a few drizzles of olive oil. Mix. Taste. Smile. Adding those traditional pesto ingredients moved the flavors along to a brighter result, less of a one-note, overly-salty, olivey taste. Oh yes, this final combination was seriously delicious! So what do I call this merging of recipes - pesto or tapenade? Is it a sauce or a condiment? Italian or French? 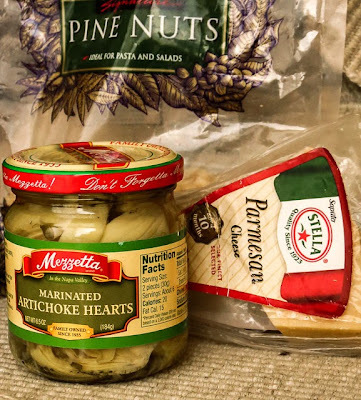 My Artichoke Basil Olive Pesto Tapenade is definitely not a classic... anything. Who cares?! It is deliciously habit-forming, an assertive, flavorful treat. Yesterday it starred as a quick and easy Pesto Tapenade Sauce for pasta at lunch. Delicioso! 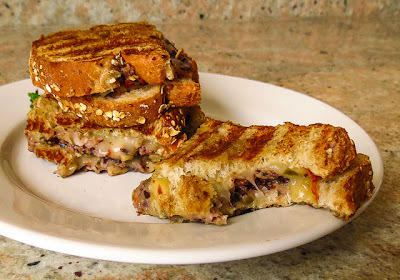 Today it was a Tapenade Pesto Spread that lifted an ordinary grilled cheese sandwich to a whole new level. Scrumptious! 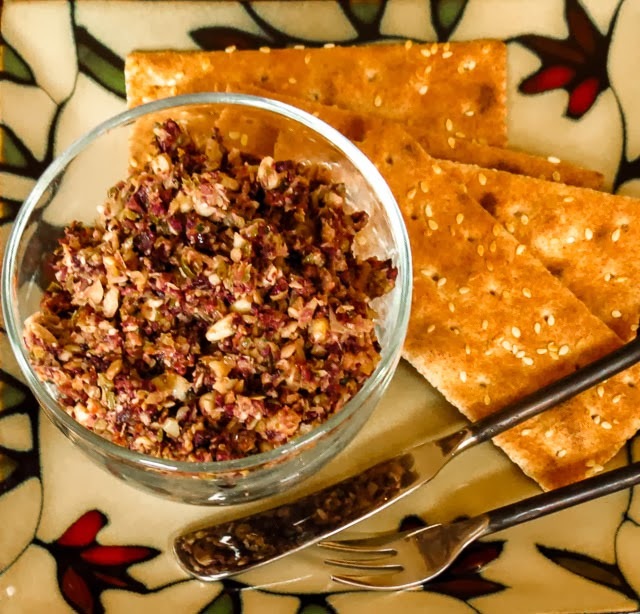 Use Artichoke Pesto Tapenade to build a muffuletta sandwich, or top a cracker or liven up some crostini. Try it as a pizza topping or ... well, whatever, be adventurous and try it in your galley. Place all ingredients except cheese and olive oil in the bowl of a food processor. Pulse in short bursts until the pieces are roughly the same size, adding olive oil as needed to hold the mix together. Stir in the cheese with a spoon or spatula. Be careful not to overprocess or you will end up with an olive paste, still tasty but really ugly. Taste and adjust to suit your palate. 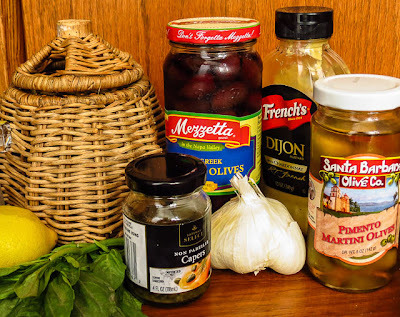 Note: To sauce pasta you may want to add more olive oil to loosen it up, perhaps add some hot pasta water to the tossed pasta and tapenade if you like it even saucier. 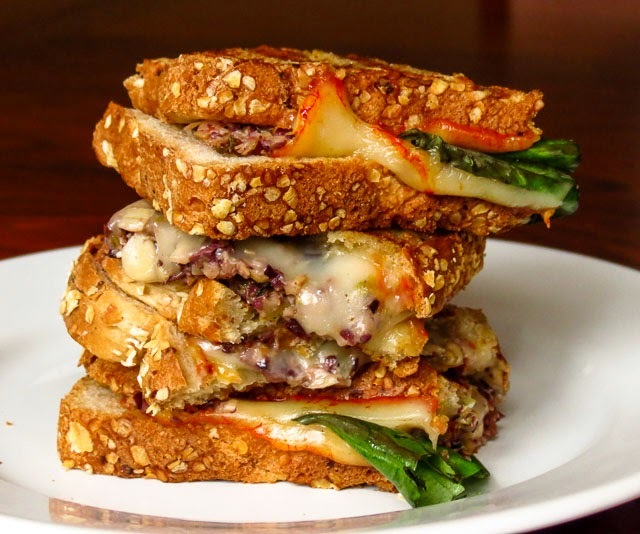 What a great sandwich....we love artichokes. I have never tried an artichoke pesto but I am certain we would love it! Great selection. Thanks, Kate. I love almost any grilled cheese sandwich and this one makes my Top Ten List. Not for the sodium averse, but definitely tasty. Thanks, Lea Ann. I'm envious of your freezer full of pesto, it will brighten a winter full of cooking. It stores well for weeks so it's handy for impromptu entertaining. Oh that looks like a great sandwich! Great SRC choice! I have some artichokes in the cupboard that I've had for ages but hardly ever use so I might just try this version inspired by my two recipes! Corina, I enjoyed reading through your archives and bookmarked a bunch of your recipes. Each month SRC is a terrific introduction to other blogs and interesting people. Enjoy the holidays with your little one! Got it pinned. It looks amazing. I'm with you! As long as it's tasty, I don't get too concerned about names. :P And the first thing I thought when I saw this page was yum! CJ, love your comment regarding names... and chuckle when I think of your Pond Scum Soup recipes. This is one tasty looking grilled cheese! ...and it tasted a LOT better than it looks! This looks so good!!!! Great choice! I am definietly going to try this on a muffuletta sandwich! Now that's a sandwich! Looks incredible! Thanks for sharing! it WAS a bit messy, but really, really good!